Click through to see what the hottest celebs in Hollywood have been up to in the last 24 hours! Legendary actress Sophia Loren overheard calling friend and two-time Oscar nominee Carol Connors “bella” at the Montage Beverly Hills for a special screening of "Mary Poppins Returns." Actress and legend, Angela Bassett, slayed this past weekend on the SAG Award’s carpet. The SAG Award winner (for her role in Black Panther) stunned in a plunging light-grey dress paired with Jockey Skimmies Short Length Slipshorts underneath! 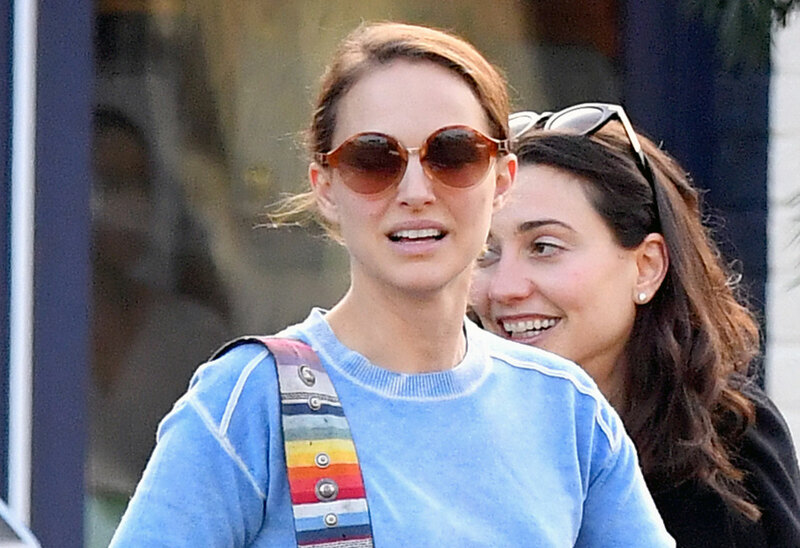 Natalie Portman spotted rocking a gorgeous Dior purse as she leaves lunch with a friend. Demi Moore attends The Hollywood Reporter 2019 Sundance sponsored by Heineken on January 28, 2019 in Park City, Utah. David Arquette and Nathan Stewart-Jarrettat the Mope Premier Party in The Fly Lounge powered by Airthereum. Shanola Hampton sipping lemon perfect cold pressed water at The Last Call Music in Film Summit at Park City Live. Mark Wahlberg spotted looking very casual while leaving E. Baldi Ristorante in Beverly Hills after having dinner with friends. Christina Applegate stars in her first Super Bowl commercial alongside the M&M’S spokescandies to announce new M&M’S Chocolate Bars. Biore Brand Ambassador Madelaine Petsch on set promoting the skincare brand`s newest launches. Busy Philipps shares a breakfast that makes her girls happiest - pancakes with sprinkles made possible with real dairy milk. Vanderpump Rules star Lala Kent and fiancé Randall Emmett were seen shopping at Top Shop Top Man while sipping Lemon Perfect cold pressed water. The newly engaged couple caught the ADAM panel which featured discussions around the trans community. Jessie James Decker turns to protein-packed, 100% beef Jack Link’s jerky to power through her busy schedule. Eric Decker teams up with Horizon Organic to launch the first organic high protein milk. The stylist ladies of ‘LadyGang’ on E! are wearing their custom embroidered STS Blue Jean Jackets while out and about in sunny Los Angeles, California! Jake Gyllenhaal flashes his million dollar smile at the premiere of Velvet Buzzsaw in Los Angeles. Avril Lavigne and Macy Grey together backstage before performing at The Fly Lounge powered by Airthereum. On Saturday, Snoop Dogg attended The Stronach Group's Pegasus World Cup at Gulfstream Park in Hallandale Beach, Florida. Upon arrival to North America’s richest Thoroughbred horse race, the rapper was seen admiring Brett David's Pagani Huayra L’Ultimo. Odell Beckham Jr. had a life changing trip to Dubai. According to his social media, the New York Giants wide receiver was spotted spending his post season holiday at the ultra-luxury One&Only Royal Mirage, Dubai’s poshest beach resort. Odell spent the day relaxing at DRIFT, One&Only Royal Mirage’s chic beach club surrounded by a group of friends. Later that evening the football player was spotted dining at the elegant Hakkasan restaurant at Atlantis The Palm. KAOS Dayclub & Nightclub Presents G-EAZY at Park City Live on Friday, January 25, 2019. America Ferrera and her husband Ryan Williams take their baby grocery shopping in West Hollywood. KAOS Dayclub & Nightclub Presents G-EAZY at Park City Live. Casamigos kicked off the first weekend of Sundance with Michael B. Jordan at TAO Park City. Casamigos kicked off the first weekend of Sundance with Gerard Butler at TAO Park City. Mindy Kaling receives the IMDb STARmeter Award at the 2019 Sundance Film Festival In Park City. Rapper Drake celebrates Draya Michele's Birthday at Beauty & Essex Los Angeles where cocktails from CIROC Black Raspberry and Deleon Tequila were poured. Madame Ghandi was seen rocking COMMUNITYmade's Mateo white sneakers. These stylish shoes are handmade by LA based artisans that use sustainable, locally sourced materials. For every pair of shoes sold, the brand donates $10 to a local community effort that is uniquely chosen by the consumer at checkout! Nikki and Brie Bella took a break promoting their E! show Total Bellas Thursday by indulging in CrazyShakes at Black Tap in Midtown Manhattan. E!’s ‘Wags’ star Amber Nichole Miller — wearing a dress by Speechless — was spotted on the red carpet in L.A. next to her love Tito Ortiz, as well as ‘Vanderpump Rules’ star Lala Kent and fiance Randall Emmett. Golden Globe winner Patricia Arquette caught chatting it up with Sweets Party Treats Founder Rachele Sweetser celebrating at a Golden Globe party. Newlyweds Malin Akerman and Jack Donnelly attend the grand opening of Raspoutine Los Angeles with treats! Magazine on January 18, 2019 in West Hollywood, California. Kristin Chenoweth enjoys guacamole on set while shooting her new Big Game TV ad campaign with Avocados From Mexico. Priyanka Chopra Jonas rocks American Eagle jeans in Los Angeles, CA on January 22nd. Kristen Stewart was spotted attending the Chanel Haute Couture Spring-Summer 2019 show in Paris. Singer Adam Lambert and his drag queen pal Sham Ibrahim partied together at a nightclub in West Hollywood! Sham recently tweeted that Adam’s version of Cher’s “Believe” was amazing and it will be elevator music playing on the way up to Heaven! Olivia Munn showed up looking effortlessly chic while heading to Largo in West Hollywood. G-Eazy was spotted dining at Vandal in New York City with a group of friends including tattoo artist JonBoy. The ‘No Limit’ rapper posted a slideshow of photos from the dinner on his Instagram account, capturing the group enjoying a table filled of Vandal favorites like the Tortilla Soup Dumplings, Crispy Bao Buns and Old School Chicken Parm. Joey Fatone throws a party for the Big Game with Heluva Good! and the new, limited-edition FootBowl. bareMinerals Global Beauty Ambassador Rosie Huntington-Whiteley at the brand’s #GoodThatLasts event to celebrate the new BAREPRO Longwear Lipstick. Mark Consuelos kicks his day off with McCafé® at Home coffee at the Brew Happier Mobile in Chicago. Eva Longoria sports Old Navy High-Rise Compression Leggings as she checks into her hotel in LA. ‘Keeping up with the Kardashians star and foodie ‘FoodGod’ Jonathan Cheban dined on caviar/tuna cigars, hearts of palm crab cakes & filet mignon and caught up with beautiful CEO Elizabeth An at Crustacean in Beverly Hills. Actress on the Hawaii Five -go!! Statuesque & stunning ‘Hawaii Five-0’ actress Kristen Dalton seen kicking off her heels and putting on her comfy LAMO boots after she left the new Happy Hour at world renown Crustacean Restaurant in Beverly Hills. She even took extra An’s world famous garlic noodles home for later! Rob Shuter and Rita Cosby joined Mavatar CEO Susan Akbarpour for the mCart "Make Everything Shop-able" presentation and dinner at Zuma NYC. Tom Sandoval from Vanderpump Rules stops by the opening of Gastro Lounge LN2 Pizza Shoppe on Melrose Avenue in L.A. to sample their gourmet pizza and nitrogen ice cream. Actor Josh Duhamel is seen with a pilates instructor Shannon Nadj leaving the Delilah restaurant together. Snack Break! Vanessa Lachey takes a break from play time to enjoy new Yoplait® Dunkin’® yogurt with her son. Drake performed at XS Nightclub at Wynn Las Vegas during CES. Jackie Bradley Jr from the World Series Champion Boston Red Sox celebrated Los Angeles Angels player Chris Young’s wedding this past weekend at celebrity hot spot Grand Velas Los Cabos. Joey BadA$$ and Kitty Cash celebrate with Hennessy V.S.O.P Privilège at Kitty’s birthday party at Boom Boom Room in New York City. Celeb fitness trainer Harley Pasternak shares at-home workout routines using his favorite fitness gear from Marshalls in New York City. Blake Lively and Ryan Reynolds host reception and a special screening of "Mary Poppins Returns" for Emily Blunt and filmmakers in New York. Camila Mendes takes her coffee on-the-go in Vancouver in Old Navy’s High-Rise Compression Leggings. Leighton Meester kicks off National Milk Day by teaming up with Shamrock Farms to help fight hunger (in partnership with Feeding America). Jessie James Decker chooses CeraVe Healing Ointment in the skincare aisle. WW Ambassador DJ Khaled works on his wellness poolside in Miami. Former Disney Star alum, Bella Thorne, attends The Celebrity Experience in Universal City on Sunday, January 6th. The Celebrity Experience is an exclusive interactive workshop that occurs over five days uniting performers with Hollywood heavy-hitters including casting directors, talent managers and international TV & Film stars. Jenna Dewan enjoyed high-performance Bulletproof Coffee and Oxygen Bar at the annual 'Gold Meets Golden' Brunch in Los Angeles. Bravo TV’s Top Chef Host Padma Lakshmi at R House Wynwood’s Sunday Drag Brunch in Miami on Sunday, January 6th 2019. Constance Wu wears Shiseido’s ControlledChaos Sapphire Spark and Black Pulse MascaraInk at the Golden Globes 2019. Actress Suzan Hughes with first-time Golden Globes nominee Ben Stiller at the Netflix after party at the Beverly Hilton in L.A. on Sunday. Gavin Rossdale spotted out for the first time in LA after the split from girlfriend Sophia Thomalla. Richard Madden enjoys Heineken 0.0 at the BAFTA Tea Party at Four Seasons Hotel Los Angeles at Beverly Hills on January 5, 2019 in Los Angeles, California. Casamigos was flowing at Oscar-winning actor and humanitarian Sean Penn's annual J/P Haitian Relief Organization fundraising gala last night at the Wiltern Theater in Los Angeles. One the eve of the Golden Globes, the glitzy soiree, hosted by Penn and emceed by Jamie Foxx, honored Anderson Cooper, San Juan Mayor Carmen Yulin Cruz and U.S. ambassador Kenneth Merten. Penn also announced the organization’s rebranding into CORE (Community Organized Relief Effort), which will expand its efforts to crises beyond Haiti — in Puerto Rico, the continental US and Caribbean. The event raised $3.5 million dollars from the live auction and featured performances by Macy Gray, Billie Eilish and Yusuf Islam. Critically acclaimed Director of Academy Award winning movie Training Day, Antoine Fuqua and his stunning actress wife Lela Rochon celebrated New Year’s Eve with friends at family at world renown Beverly Hills hotspot ‘Crustacean’ where guests dined on Prime Filet Mignon, Crab, Caviar, Decadent Chocolate Tartlet: Salted Caramel, Chocolate Crumble with chilled Dom Perignon. Celeb stylist and TV personality Ali levine attends ‘Fab Fit Fun’ Holiday party wearing Kut From The Kloth’s Faux Fur Jacket in Hollywood, CA. Specialty Casamigos cocktails were enjoyed by notable attendees including Julia Roberts, Jimmy Kimmel, Mike Myers, Ben Stiller, Connie Britton, Larry David, Keegan-Michael Key, Michelle Yeoh, Taron Egerton, Sara Gilbert, Rachel Zoe, Sarah Silverman, and more. Empire’s Jussie Smollet vacationed at Grand Velas Los Cabos where he enjoyed ATV-ing, the resort’s posh spa and its over-the-top New Years party with fireworks. Emma Stone attends W Magazine Celebrates Its 'Best Performances' Portfolio and the Golden Globes with Audi and Giorgio Armani Beauty at Chateau Marmont on January 4, 2019 in Los Angeles, California. Amy Adams and Patricia Clarkson are honored at an intimate dinner hosted by Tory Burch and Clase Azul at Tory Burch on January 4, 2019 in Beverly Hills, California. Lea Michele glows as she was seen leaving dinner at 'Craigs' in West Hollywood, CA. Justin Combs and Tory Lanez are all smiles while celebrating at a star-studded soiree with a Toast by CÎROC. Nene Leakes and Husband Gregg Leakes celebrate with DeLeón Tequila and CÎROC Black Raspberry at Bar ONE. Alan Dershowitz and Sean Hannity attended the Premiere Collectables podcast promoting Dershowitz's new book, The Case Against the Democratic House Impeaching Trump, on January 3. Ashley Graham was spotted out and about in New York City rocking an all black Alala outfit. New Years Eve Beauty Queen! Stunning model and The McCord List founder Rachel McCord was all smiles and endless legs as she celebrated New Years Eve at the renown world class Crustacean restaurant in Beverly Hills. Post Malone rang in the new year with a performance at Marquee New York, following his show at Madison Square Garden. Cardi B was spotted celebrating the conclusion of her whirlwind Australian tour at Marquee Sydney on New Year's Eve with friends. Rocking a blue wig, Cardi B danced, sipped on bottles of Dom Perignon and wished the crowd a happy and fun year ahead, before jet-setting to New Zealand the following morning. Khloe Kardashian rings in 2019 with Moët & Chandon Nectar Impérial Rosé at Rumor in Cleveland, Ohio. Mr. Mauricio and DJ Khaled before his performance at STORY in Miami celebrating 2019 with CIROC Black Raspberry. Luke Wilson started the New Year by relaxing by his pup in a park. Celebrity hypnotist Kimberly Friedmutter — the author of the upcoming book Subconscious Power — hung out with singer Robin Thicke in Malibu. Robin Thicke, styled by Matrix, performing at Marquis New Year's Eve powered by Holr Media Group and Konica Minolta at Marriott Marquis New York. After celebrating its grand opening on Friday night by hosting the official after-party for Lady Gaga's intimate Park Theater residency debut, On The Record at Park MGM treated New Year's Eve revelers to an entertaining throwback scene full of surprises throughout the night and the immersive speakeasy and club. Lil Dicky closed out the night performing his unique blend of comedy-rap entertainment which kept people moving to the beats and laughing out loud. Kelly Rowland looks super comfy in grey sweats while spotted getting into a car in LA.